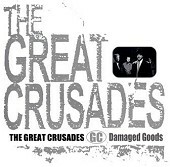 Roots-rooted pop-rock with a twist, The Great Crusades are the rare breed, able to craft genuine pop songs, run them through a roots-rock filter, and still maintain the integrity of the original pop masterpiece, never subtracting from its addictive-ness, only taking away from it. The outcome is Damaged Goods, an album anything but. This is powerful, hard-hitting rock songs with gust, not afraid to be bold or to unload plenty of Americana moments. I'll give it an A-.